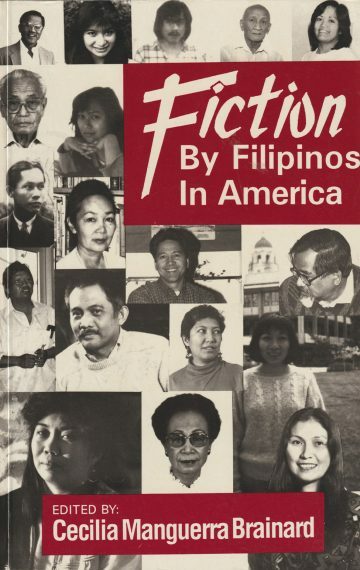 Cecilia’s inspi­ra­tion to col­lect and edit Fic­tion by Fil­ipinos in Amer­i­ca came about when she could not find such a book in the 1980s. The anthol­o­gy was fund­ed by a Brody Arts Fund and col­lects 23 sto­ries by Fil­ipinos in Amer­i­ca, includ­ing Lin­da Ty-Casper, N.V.M. Gon­za­lez, Juan Dion­i­sio, Bien­venido San­tos, Cecil­ia Manguer­ra Brainard, Manuel Viray, Car­los Bulosan, Lig­aya Vic­to­rio Fru­to, Jean Ven­gua Gier, Alber­to Flo­renti­no, Michelle Cruz Skin­ner, Jes­si­ca Hage­dorn, Pauli­no Lim, Jr., Samuel Tagat­ac, Vir­ginia Cere­nio, Julia Palar­ca, Oscar Penaran­da, Erlin­da Vil­lam­or Kravetz, Nadine Sar­real, Mar­i­anne Vil­lanue­va, Manuel Olimpo, Nenutz­ka Vil­la­mar, and Luis Cabalquin­to.